Sign up for the Free Internet Marketing Newsletter by Marketing Experiments. Your free subscription will give you full access to two interactive web clinics per month plus bi-monthly research briefs. Online knowledgebases and resources portals. Some are free, some require payment or a membership in order to be able to access all their content. All of them provide at least some useful resources for free so each of them is worthwhile to check out, with budget or without. Marketing Sherpa tons of Articles, Case Studies and research studies. A lot of the content can be accessed free, but full access to all data is only gained via a paid annual membership subscription for a relative low price. 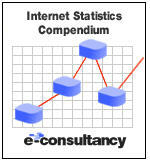 e-Consultancy UK - Internet Marketing Research, Best Practices, Benchmarks and Statistics for the United Kingdom. However, the information are also interesting for non-UK companies, especially the best practices guides and case studies. MarketingCharts.com provides free access to economic figures, statistics and charts. WebmasterResources.com - Internet Marketing Resources Site by Internet Marketing Coach Gabriel Zappia. by e-Consultancy is over 200 pages long, frequently updated and packed with numbers and statistics to the roof. A comprehensive compilation of internet statistics and online market research with data, facts, charts, and figures ...more. Buy it for $299 or become a e-Consultancy member (memberships start at $389.00 per year) for access to this report and dozens of other statistics, buyers guides, benchmark guides, white papers and more. Enterprise Resources at CIO Magazine. The Electronic Commerce Research Center forchief information officers around the world. The Customer Institute, a blog by William H. Bleuel, Professor of Decision Sciences Graziadio School of Business and Management at Pepperdine University. Insider Secrets to Marketing Your Business on The Internet - Internet Marketing course (Multiple CD's and DVD's and print material). This selflearning course is provided by MarketingTips.com. AMA Blended Learning - Management Training by American Management Association. Training classes and certifications for various internet marketing topics, including search engine optimization, paid search advertising, email marketing, landing page optimization and online testing. The Internet Marketing University Training Program used to be a commercial program where you had to pay a lot of money for. Internet Marketing University decided to publish their 20+ hours of educational videos for free. It is not available yet, but you can sign-up to get notified via email, when it is ready. Google Guide - The Google Guide is a free online interactive tutorial and reference for experienced users and novices about how Google works. Forrester Research is a publicly traded and independent technology and market research company. Access to can be acquired via paid membership or per statistic. Some free content is also provided. compScore maintains massive proprietary databases that provide a continuous, real-time measurement of the myriad ways in which the Internet is used and the wide variety of activities that are occurring online. MarketingSherpa Store offers industry benchmark guides, how-to's, case studies and more interesting data for marketers available for purchase in print and digital format. Marketing Sherpa Benchmark Guides contain a large amount of industry statistics & benchmarks and data analysis conclusions & tips based on data acquired via large scale industy surveys and conducted experiments that are interesting for the US and North American internet marketer and online business executive. e-Consultancy Benchmark Guides are the equivalent of the MarketingSherpa guides, but created for the British marketed, based on data that were collected within the UK. Check out the Internet Marketing Benchmark Guides for various internet marketing subjects and industries. Luckily for you, there are also a number of free sources of statistics and other research material on the internet besides the big and commercial research and statistic companies that I listed above. Here are a few of those websites that I consider noteworthy. If you come across any additional sources, let me know and I will post it here. Thanks. MarketingExperiements Research Archive - MEC Labs Group. MEC is an online laboratory that tests every conceivable marketing method on the Internet. Free Information at Marketing Sherpa, Executive Summaries, Audio Specials, Benchmark Guides, Buyers Guides, How-To Handbooks, Summit Presentations and more. InternetNews.com Stats, formerly called "Cyberatlas", a collection of constantly updated stats to internet usage and adaptation. The-DMA.org Research - Marketing research and statistics provided by the Direct Marketing Association (DMA). Hitwise US Datacenter provides monthly reports on top keyword terms per industry and other interesting statistical information, like the top websites and leading search engines, based on the vast amount of usage and click-stream data Hitwise has access to. Compete.com Blog publishes pretty much daily another traffic statistic for different verticals. eMarketer Stats at IAB - Industry Stats & Data provided monthly by eMarketer for the Interactive Advertising Bureau website. IAB Internet Advertising Revenue Report conducted by PricewaterhouseCoopers (PWC) and released free twice per year on the IAB website. DoubleClick Performics Think Tank provides original research, white papers, case-studies and more to internet marketing related subject, especially affiliate marketing, paid search, SEO and comparison shopping/retail. Why should you become a MarketingSherpa Member? Research: 2,800+ marketing numbers and report abstracts. Learn from Real Examples: 780+ Case Studies and 2,500+ Creative Samples from real-life campaigns and tests. Hands-On How-to Guides: Best practices for everything from B-to-C emails to B-to-B lead generation campaigns. Members-only Discounts: Get 10% off everything in SherpaStore *immediately*! Top-Notch quality: MarketingSherpa is praised by many marketers (including myself) and publications. Just sign-up for the MarketingSherpa Membership seven days FREE trial, no risks and no obligations and get access to 11,000+ useful resources for internet marketers today. After the seven days trial and after you could see for yourself that I wasn't just blowing fluffy air into your ears, get your year-long membership at the discounted introductory price of $397, that's $200 off.